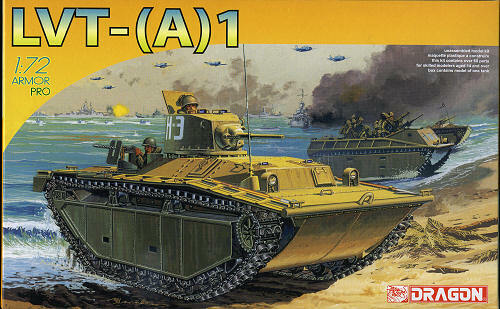 The LVT-(A)1 is based on the improved LVT-2. This fire support version had an armored (6 to 12 mm) hull. It was fitted with a turret nearly identical to that of the Light Tank M3, with a 37 mm Gun M6 in an M44 mount, and also carried two rear-mounted machine guns. 510 units produced. Now here is a neat 1/72 kit from Dragon as part of their Armor Pro series. What that means is that there is photo etch included. This is quite minimal consisting only of machine gun shields. The kit also has Dragon's DS tracks, this time requiring two of these for each side. There are two other sprues for the usual stuff and a one-piece hull. The kit is thankfully limited in terms of fussy bits and pieces. For sure, there are hand holds and some cleats as well as some tie down rings, but no road wheels to fuss with. Only a few return rollers to worry about. Since there is no interior, the build should go rather quickly. There is a full 37mm gun along with its coaxial machine gun and another pair of guns at the rear (for which the shields are provided). Instructions are the smaller color variety on slick paper. Seven well drawn construction steps and the usual Gunze and Model Master paint references. There are five markings options. Four of them are olive drab with two from 'unidentified units', one from the Peleilu campaign in 1944 and another from Keise Shima in 1945. The fifth option is in 5-O Ocean Grey and participated in the Saipan campaign during 1944. While the instructions would have you mix three colors, I'm pretty sure you can find this color pre-mixed. Overall it is a pretty neat kit. A piece of armor that isn't really armor and what looks like a rather speedy build as well. Very much worth the effort of seeking out. Thanks towww.dragonmodelsusa.com for the preview kit. Get yours at your favorite retailer.